Q. How far is the InterContinental Miami from the Airport? Q. Does the InterContinental Miami provide a shuttle to or from the airport? The hotel does not provide a shuttle to or from the airport. We recommend renting a car or taking a taxi. The taxi fare is approximately $25.00 each way from MIA and $80.00 each way from FLL. Go Shuttle Express offers shared shuttle ride service for $23.00/ person from FLL. Q. Does the InterContinental Miami have a rental car agency on site? The hotel has an Alamo Rental Car Desk in the Main Lobby. Q. How much is parking at the InterContinental Miami? Q. How far is the InterContinental Miami from the Port of Miami? Q. Will the InterContinental Miami receive packages prior to a guest’s arrival? Yes, the hotel will receive packages prior to a guest's arrival. There is a fee and that will vary depending on the size of the package. Learn more. Q. How far is the InterContinental Miami from Miami Beach? 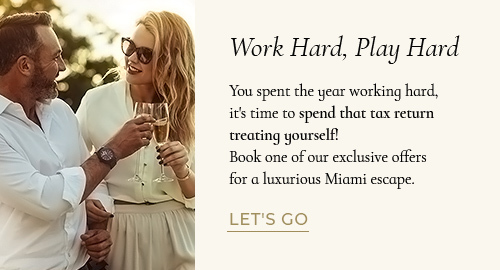 The hotel is a 15-minute drive away from Miami Beach. Q. What is your advance booking policy? If payment cannot be obtained for advanced bookings, the reservation will be canceled. Q. Do you offer rollaway beds?